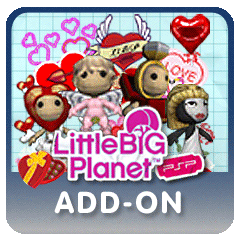 As Valentine’s Day draws near, PSP and PS3 fans will be able to dress up their Sackboys and Sackgirls with costumes of ‘Luvre’! Two new packs will release on the Store this Thursday, February 11 for the PSP, and two new packs for the PS3. The Limited Edition Chinese New Year Costumes will be available on the PS3 for free too. 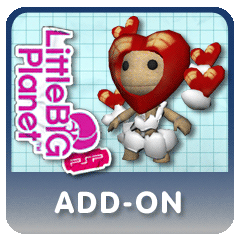 Valentine’s Day Mini-Pack for LBP PS3 ($2.99) – If you missed this last year, now’s your chance to get the Valentine’s Day pack for the PS3. With a special Cupid outfit, 10 love-themed stickers, lots of objects and 5 different types of materials, you can make enough levels for all your Valentines this year! LIMITED TIME – Hurry, these items will disappear from the Store on 2/25. 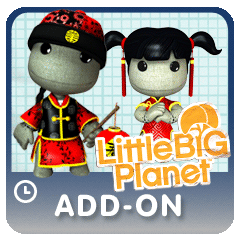 Chinese New Year Costumes for LBP PS3 (FREE) – In celebrating the upcoming Chinese New Year, be sure to download this free costume pack, complete with his/her traditional costumes for this special time of year. LIMITED TIME – Hurry these items will disappear on 2/25.